The way to someone’s heart is often through the stomach. What better way to show love and culinary creativity by giving something from your kitchen; homemade Sambal Badjak. Though this spicy ‘chili-based’ condiment is not for the faint hearted, it will surely make a lasting impression. Sambal Badjak was our signature condiment in the family restaurant Djokja in Amsterdam. There are many different sambals from different regions in Indonesia, raw or cooked. Sambal Badjak (in Dutch) or Bajak is originally from the Island of Java and literally translated means pirate’s sambal. I wonder why…? Is it because of its heated and brutal take-over of my taste buds? It does have a tasty impact for sure. While it compliments most dishes, it is usually served with grilled or fried fish or chicken. I also dip my Krupuk Udang in it or some crudités and eat it with a side order of steamed rice. This special mix of ground chili’s, shallots, garlic, terasi, brown sugar, coconut milk and different spices is not as explosive as some of the other sambals. It is somewhat milder because of the frying of the ingredients and the use of coconut milk. Finely chop the shallots and the garlic. Grind the candle nuts. Instead of using fresh hot chillies I recommend to buy sambal oelek in a jar – a time saving shortcut. Take a wok (or wadjan), heat up the oil and stir fry the shallots and the garlic. Add the candle nuts, the galangal, and the lime leaves. Once you can smell the aroma, start adding the sambal oelek, the tamarind liquid (dried tamarind soaked in water) and the terasi (shrimp paste). Then add the santen (coconut milk). Add the sugar and salt to taste. Let simmer on low heat. Keep stirring. The colour will turn dark red. The sambal is ready when the oil starts to surface. Let it cool off. Fill some jars – a big one or a sampler size. Treat the eyes by giving some attention to the presentation; add a personal label and some festive paper or fabric to cover the lid. Go spread some spice of life. Hello, your recipe sounds delicious. We are in the US and were wanting to use my husbands sambal badjak recipe to give as gifts. The problem is that we want to make sure it is preserved by the pressure canning method. 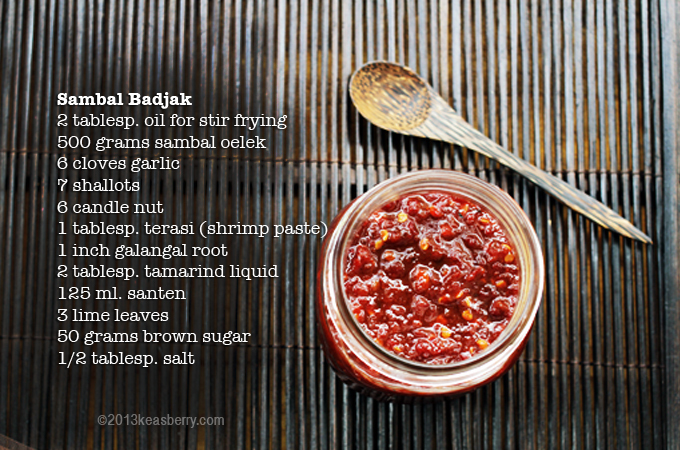 Do you know how to pressure can your sambal badjak recipe? Any info would be appreciated. Thanks. I have never had to use pressure canning. Usually food with high acidity would not require pressure canning. When you cook Sambal Badjak it is a way of preserving already. Here is a link you might find useful: http://www.simplycanning.com/water-bath-canning.html.